After breakfast city tour of Warsaw. A half-day sightseeing tour includes Old Town, beautifully rebuilt after World War II, with the impressive Royal Castle, seat of the kings of Poland. Here the Constitution of May 3rd was proclaimed in 1791, the second oldest constitution, after the US Constitution, in the world. You will admire some of its 300 rooms and see the Canaletto Room with 23 of his paintings, the Throne Room, the magnificent Knight’s Hall with six large paintings by Marcello Bacciarelli, the Marble room with its 22 portraits of Polish kings and the largest and most impressive of all the castle’s chambers, the Ballroom. After lunch served at a local restaurant in Old Town, we continue our tour with a drive to the area of the former Warsaw Ghetto. En route, you will see the building of the National Opera House and Town Hall. During your tour of Warsaw we invite you to the famous Warsaw confectioner “Wedel” to taste the delicious hot chocolate and cake at the “Wedel Old Fashioned Shop”. This evening you will have a chance to listen to a piano recital of the works of Chopin, Poland’s greatest composer. 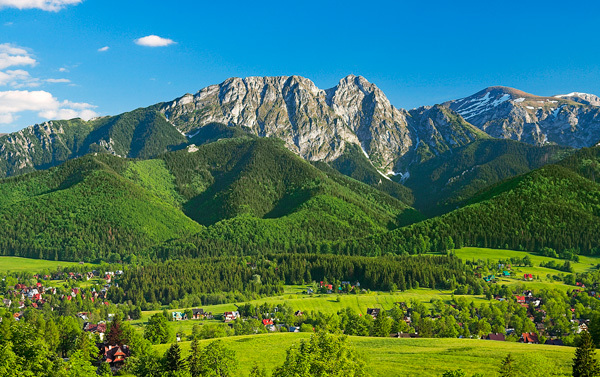 In the morning, you will have a sightseeing tour of Zakopane, whose wooden architecture blends with the natural landscapes and it is copied in other parts of Poland and is known as Zakopianski Style. You will visit the Jaszczurowka Chapel, a great example of the wooden architecture in Zakopane, and the Sanctuary of Our Lady of Fatima at Krzeptowki, which was built by the people of Zakopane to thank the Lady of Fatima for saving the Pope after an attempt on his life. Admire the breathtaking views of the Tatras from the top of Gubalowka Mountain and shop for souvenirs of arts and crafts of the Highlanders (Gorale) in the local shops. After lunch on your own you will have a free time. Before we continue on to Krakow, take a spectacular rafting trip on the Dunajec River in Pieniny National Park. Tonight’s dinner will be served at a local restaurant in Krakow’s Old Town Market Square. The morning sightseeing tour will feature Wawel, the Royal Castle, home to three dynasties of Poland’s monarchs. Its stately halls and exquisite chambers are filled with priceless art, valuable period furniture and rare ancient objects. The collection of monumental 16th century tapestries is matchless. You will also visit the Wawel Cathedral, the place of the cult of St. Stanislaus and St. Jadwiga, Queen of Poland. Its 18 chapels are true architectural masterpieces. The giant bell, Zygmunt from 1520 ranks with the world’s largest. This is the place where Polish kings were crowned and buried. Following a short break for coffee and cake at the famous Krakow café, “Jama Michalika”, a place designed by local artists with beautiful glass-painted windows and interesting drawings, we drive to Old Town with its restored Main Square of magnificent houses and palaces. There, you stop at St. Mary’s Basilica where to see the magnificent wooden altar by Wit Stwosz. In the middle of the square is Cloth Hall built before 1349, but renovated in the 16th century with many shopping stalls inside. After lunch we derive to Auschwitz to visit the Martyrdom Museum of the former Nazi concentration camp, the infamous factory of death. In the morning time on your own. Coffee and cake at the famous Krakow cafeteria. In the afternoon, drive to the Wieliczka Salt Mine, an unforgettable tourist attraction with underground chambers, grottoes, and chapels carved from salt. Dinner with a folkloric show will be served at a local restaurant in Wieliczka, before we drive back to Krakow. Hotels don’t have triple rooms.We may provide a double room with an extra bed (usually a roller bed or sofa) large enough for a child less than 7 years old.